Matthew Horowitz had a prestigious job as an art restorer at Lowy Framing & Restoration in New York City, the nation’s oldest and largest fine arts services firm. Recently he recalled lying on the floor of his empty Manhattan apartment and crying about leaving that life and career behind. But coming home to Santa Fe turned out to be a good decision for Horowitz, now 32. 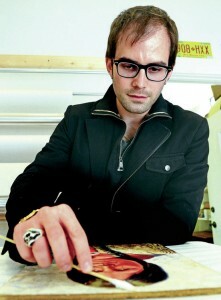 He established an art restoration department at his father’s shop, Goldleaf Framemakers of Santa Fe. He now leads the team constructing Zozobra, the 50-foot-tall marionette burned every year at the beginning of Fiesta. And he is engaged to be married in June. At Goldleaf Framemakers, where he works on restoring and cleaning damaged and dirty artwork, the smell of pungent lacquer and burned cigarettes wafts through the air. Music plays from a loudspeaker against the soundtrack of sanding and hammering.